Temples in Rajasthan depict their architectural elegance which got a new definition from 8 to 11th century. Giant temples with magnificent idols, sculpture works and artistic carvings point to the grandiose society that different kings presided over during their times. The most famous places of worship in Rajasthan are Dilwara, Somnath and Mahaviratemples. The Jain temples in Jaisalmer, Birla Mandir, Jaipur, Eklingji Mandir, Udaipur, Brahma Mandir, Ajmer and Karni Mata temple in Bikaner showcase the diversity of people who follow different customs and religious practices. Ajmer Sharif Dargah attracts not just Muslims, but people of other faiths too visit this Sufi shrine in large numbers throughout the year. 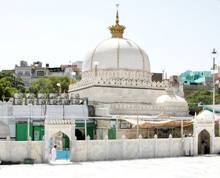 This place is considered as the final resting place for ‘Garib Nawaz’ or KhwazaMoinuddin Chishti which is situated in Rajasthan’s Ajmer district where people of all religion come to participate in annual Urs. Urs is a festival which belongs to Muslim religion but actively celebrated among all communities. It is celebrated for three days. Govind Dev Ji temple is one of the popular temples dedicated to Lord Krishna. The temple is dedicated to Lord Krishna and has bright hours during the time of Janmashthami which is considered as the birthday of Lord Krishna. The temple structure dates back to 1890 CE and has a brilliant architecture of red sandstone as its settings. Eklingji temple is an impeccable temple for Lord Shiva worshippers. 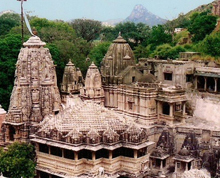 It is situated in North Udaipur and is well-known for observing the groups of 108 temples in one place. The centre of attraction of this temple is the 50-feet high multi-faced idol of Lord Shiva which is completely made out of black stone. This is a famous Shiv temple constructed in 1531 by Queen Nanak Devi of Rao Ganga. There is a water reservoir known as "Ganga Bawari" located near the Shivling inside the shrine. It is a drinking water tank. Temple has an ancient and revered ‘garbha griha’ (inner sanctum), mandap bhavan and kirtanbhavan which has the beautiful work of carved Chhitar stones. This old temple attracts thousands of Shiva devotees in and around Jodhpur. It is known by other name Chaumukha temple also. This 15th century temple shrine is known for the unique architectural style of a 'Nalinigulm Vimana', a heavenly aircraft. It took 65 years for the construction to be completed and is one of the largest Jain temples in Rajasthan. Temple has three storeys, 80 domes and 29 halls. Visitors get surprised by seeing the pavilions of the temple which are supported by 1,444 pillars. The innermost part of the temple is adorned with a four faced image of Lord Adinath or Rishabhdev. Adishwar temple is located at Sanderao near Pali city. One can easily reach here by bus or taxi. Also popularly known as Dargah Sharif. It is most popular and important Muslim pilgrimage. People from all the communities come here and pay homage in the dargah of Khwaja Moin- ud-din Chisti at Ajmer Sharif. Ajmer Sharif is famous for fulfilling the wishes of the devotees. Various followers of different religion offer flowers, velvet cloth, perfume (non-alcoholic) and sandalwood at the dargah. Ajmer Sharif Dargah is the tomb of the Hazrat Khwaja Moin-d-din Chisti, who was the founder of Sufism in India. He was also a great preacher of Islam. He was known for his noble teachings and peace. This Sufi saint had come from Persia and died in 1236 CE in Ajmer after winning all hearts. He was also known as "Khwaja Garib". Later Mughal emperor Humayun, Akbar, Shahjahan and Jahangir constructed mosques here to perpetuate the memory of Khwaja Garib. This beautiful temple is one of the well-known tourist attractions of Jaipur. The temple is known for its elegant architecture, magnificent idols, sculptures, and carvings. The mega edifice is dedicated to the Hindu God Narayan. Akshardham temple provides the real glimpse of Indian architecture, cultural heritage and sculptures of Hindu gods to the visitors. It is located in the Vaishali Nagar, Jaipur. Famous by the name Adhar Shila, this temple is located on top of sandstone called ‘Massuria hill’. The giant hill is on route between Jalori Gate and Nagori Gate of Jodhpur. Baba Ramdev temple history allures visitors to know more about its past. 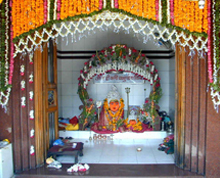 Known for its divine ambience, Baba Ramdeo temple has long list of followers and stories of local beliefs. This mysterious temple has tiny rock at its entrance with the inscription "Enter at your own risk". This makes travellers more curious towards the temple. Both devotees and adventurous people visit the place for the spectacular views of scenery from the top of the temple. In the past one would climb the hill through rickety stairs against vertical rock pillars. But now proper stairs are made which had made the task easier to reach the top and take amazing views. A temple dedicated to Goddess Chamunda Devi, the favourite deity of royal family. It is located in the southern part of Mehrangarh Fort. Founder of Jodhpur city, Rao Jodha brought the idol of his favourite goddess Chamunda Devi from old capital of Mandore in 1460. He installed Chamunda Devi idol in the Mehrangarh Fort and from then Chamunda become their deity. Worshipped and visited by many devotees in and around Jodhpur. At the time of Dussehra, the fort comes alive with devotees, festivals and bhajans. Charbhuja means ‘four arms’ referring to Lord Vishnu. The temple was built by Gang Dev who received divine instructions from Lord Vishnu in his dreams. Believing his dream, Gang Dev recovered an 85cm-high idol of Shri Charbhuja ji. It was also believed that more than 125 battles were fought to protect this temple and many times it was submerged in water for its protection. It is said Pandava princes also worshiped this Shri Charbhuja idol. The temple is located in the village Garhbor of Rajsamand district. Garhbor drive its name from the fort made by Bor Rajputs. 'Garh' means fort in Hindi. It is situated 38 km from district headquarters of Rajsamand and 103 km north of Udaipur. Also known as Shri Godisa Parshwanath Bhagwan ka Mandir, this Jain temple is dedicated to Parasvanath who is a Jain Tirthankara. It is located on top of a hill-lock west of Barmer city and was constructed in 12th century. Parshwanath temple is famous for its sculptures and ornamental paintings which make its interiors attractive. Visitors must also see the rich glass inlay work of the artisans in the interior part the temple. The temple is dedicated to Lord Shiva and located at a distance of 24 km away from Dungarpur at Deo Gaon. Situated on the banks of the River Som, it was constructed during the rule of VikramSamwat in the 12th century. Beautifully built with white marble stone, Deo Somnath walls have many inscriptions. It is a replica of the Somnath temple of Gujarat and also resembles one of the Khajuraho temples of Madhya Pradesh. At the entrance of the temple, massively carved structure of stone elephant and Lord Shiva bull made of stone sit at the entrance. The encrypted walls have handprint panels which are believed to be of those women who immolated as "Sati". Temple domes present a fine architecture and resembles Ranakpur Jain temple. The aesthetically carved stone pillars with series of sculpted figurines and inscription add beauty to the Jain temple. One of the world's most beautiful and sacred pilgrimage centres of Jains, Dilwara is located 2.5 km from Mount Abu. Mount Abu is the only hill station in Rajasthan. 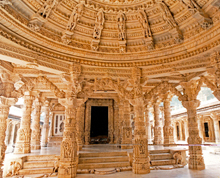 Dilwara temples are known to have exquisite architecture and incredible work of marble carvings. Some experts even claim that Dilwara temples have better architecture than the TajMahal. Built in between the 11th and 13th centuries AD by Chalukya dynasty, Dilwara Jain temples have simple and general looks from outside. But its extravagant doors at the entrance give enough hints about the architectural finesse that is wrapped inside. Temple complex has high walls and is surrounded by green hills. All of its ceilings, doorways, pillars and panels have minutely carved ornamental details which show its architectural uniqueness. Dilwara temple complex consist of five different temples, each devoted to five Jain Tirthankaras (saints). They are Mahaveer Swami, Adi Nath or Vimal Vasahi, Parshav Nath or Khartar Vasahi, Rishabdaoji or Peethalhar, and Nemi NathJi or Luna Vasahi temples. Dilwara temples can be easily accessible through road from Mount Abu (2.5 km). It is located in Sirohi district. One of the prominent tourist sites of Nathdwara located in the Kankroli village. This temple is also famous as 'Kankroli temple'. Hindu deity Lord Krishna is the sole deity of this beautiful temple. Here the red stone idol of the deity is worshipped with devotion. Many believes that red stone idol of Lord Krishna have been brought from Mathura. Maharana Raj Singh I built the temple in 1676. This temple belongs to Vaishnavas and the Vallabhacharya sects. Located at 65 km from Udaipur city, Dwarkadhish temple is at the shore of Rajsamand Lake. Nearby Navchauki Dam (Kankroli Dam) is a great place for bird watching. This is one of the popular pilgrim centres of Rajasthan located at 22 km from Udaipur. It was initially built by King Bappa Rawal of Udaipur. On the side of 72 rooms, a Jain temple housed a four-faced statue of Adinath, the first Jain saint. This ancient temple with historic significance is dedicated to Lord Ekalingji, the patron deity of the Mewar clan. 'Ek' means ‘one' while 'ling' means ‘lingum' or the life giving phallic symbol of Lord Shiva. Ekalingji is considered to be the actual ruler of the region while the kings serve as the Prime Minister under him. This holy temple was initially built in 728 AD but due the passage of time renovations were done by different rulers. Maharana Raimal too renovated the complex in the late 15th and 16th century.The Ekalina temple, located on the bank of the Indersagar Lake has nearly about 108 shrines, within its walls. All these temples are built of marble and sandstones. The main shrine is a double storied building, looks magnificent with its pyramidal style of roof and beautifully carved tower. In this main shrine there is a four faced black marble statue of Lord Eklingji with Brahma facing west, Vishnu facing north, Shiva facing south and Surya facing east. This historic statue is around 50 feet in height. Other statues like that of Nandi, Shiva’s bull and Bappa Rawal can be seen outside the main shrine. Bappa Rawal is shown facing Nandi with his hands clasped. Two other statues of Nandi are also there in the temple, one is carved in black stone and the other in brass stone. The outer walls of the temple are stretched with steps that descend touching the serene waters. Being located in the middle, Shivlinga is encircled by Goddess Parvati, Lord Ganesh and Lord Kartikeyan. Inside the temple complex, one can also find statues of Goddess Saraswati and Goddess Yamuna. The silver door of the main temple is curved with the images of Lord Ganesha and Lord Kartika such a way as if they are guarding their father. Two tanks namely Karz Kund and Tulsi Kund can be seen in north of the Eklingji temple. The water of these tanks is consumed during the services of the Lord. During Shivratri, the image of Lord Shiva is adorned with jewellery. Smaller temples dedicated to Amba Mata and Kalka Mata can also be found in the temple complex. The acme of the four-faceted idol is known as ‘Yantra' that stands for the ultimate reality. The Shivlinga (phallic form of Lord Shiva) adorned by a silver snake, acquires the major attraction of people to this place. Other temples like the shrines of Pataleshwar Mahadeo, Arbada Mata, Rathasan Devi and Vindhyavasini Devi are also worth visiting near Ekalinga temple. This is an ancient Hindu pilgrimage site in the town of Khaniya-Balaji. Diwan Rao Kriparam, an attendant to Sawai Jai Singh II, in the 18th Century, built the Galtaji temple. Saint Galav spent 100 years here in performing his 'tapasya'. Happy with the Galav, the gods blessed him with abundant water. The site consists of several temples and sacred kunds (water tanks) in which pilgrims bathe. The Galtaji temple, one of the jewels of Jaipur, has a marvellous complex with natural fresh water springs and 7 holy 'kunds' or water tanks.' Galta Kund, among all is the holiest one and is believed to never get dry. A spring of pure water flows from the Gaumukh, a rock shaped like a cow’s head, into the tanks. Galta temple is situated in the Aravallis and hence, surrounded by dense trees and bushes. Its awesome buildings are ornamented by painted walls, adorned by rounded roofs and pillars. Also known as the 'Monkey temple', it was recently featured on National Geographic's multi-award winning series 'Monkey Thieves'. 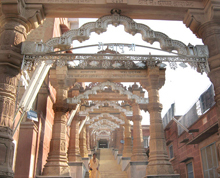 This temple is located 5 km from Jodhpur in Ratananda. According to legend, a teacher saw a giant statue of the deity on the hills of Ratananda. The statue of Lord Ganesh has a height and width was 8 feet and 5 feet. This 150-year-old temple was built where the statue had been found. A large number of devotees visit this temple every day to offer their prayers to the deity. In Jaipur, Govind Devji temple is dedicated to Lord Krishna. Royal family of Jaipur come here for worshipping ever since the main idol was brought from Brindavan in the 18th century. Lord Krishna's idol was sculpted by Bajranabh, the great grandson of Lord Krishna. The deity Govind Dev Ji is none other than Lord Shri Krishna himself. The history behind this temple is that Lord Govind Dev Ji idol was brought by Maharaja Sawai Jai Singh II from Brindavan to his own palace Surya Mahal. It was believed that the king was inspired by a dream, in which Lord Krishna told him to install the idol in his palace, to save it from being destroyed by the Mughal Emperor Aurangzeb. Later Maharaja Sawai Jai Singh built another palace for himself called Chandra Mahal. This temple has simple but stunning architecture with an open column pavilion and a slightly sunken courtyard surrounded by a low balustrade. On Janmashtmi festival, thousands of devotees visit the temple and different religious events are organised by temple management. The temple ceiling is decked with gold. The position of the temple allowed a direct view of it to the Maharaja from his Chandra Mahal palace. The idol of Govindji and Radhaji are black in colour with gold ornaments. This is a famous temple in Abhaneri village. It is located opposite the famous Chand Baori. Built during 8-9 century A.D by Chauhan king, it is a vast temple of Goddess Harsha Mata who is known to be the harbinger of prosperity. The architecture has a sanctum style scheme where a mandap is built on pillars. Its outer walls have 'Brahman bahdra' niches of god carved images and its upper sliver has the fine sculptures which make its main features. Harsha Mata idol is now protected by a boundary made of iron wall done by department of archaeology. In front of the temple there is a Lord Hanuman temple and Shiva temple is present on the right hand of lower sliver. There are also broken rocks around the pillars. This is a small shrine of Goddess Ambika Devi made in the crevice of a rock. Goddess Ambika Devi is known as a form of Goddess Durga. This temple is also famous as 'Ambika Mata temple' and due to its location in the Jagat village of Udaipur, known as Jagat temple. Known for its exterior intricate carvings, Jagat temple was built in 961 AD. Jagat temple is well preserved temple of the 10th century and also made Jagat village as ‘Khajuraho of Rajasthan’. This temple comprises the shrine of Ambika Mata in which Goddess Durga is worshipped as Shakti (power), the source of universal energy. 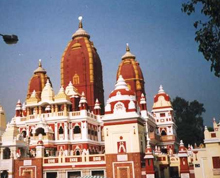 Birla temple, originally named as Laxmi Narayan temple, was constructed by Shri Rang Ramanuj Das Ji. It is believed that in 1904, Lord Laxmi Narayan came into the dream of Shri Rang Ramanuj Das. Lord Laxminarayan told Ramanuj Das that he resides beneath the land where the temple was being constructed and asked Ramanuj Das to bring him back to earth. It is situated below the Moti Dungri Fort in Jaipur. The Laxmi Narayan Temple has three domes to represent the three religions of India, a tribute to the secular fabric of the country. The Birla temple has lavish green gardens all around the temple.Laxmi Narayan temple is marvellous landmark of Jaipur architecture. It is constructed with pure white marble and modern approach. This majestic temple is in the holy city of Pushkar. Being a divine place of spirituality, the temple gets thousands of devotees who pay homage to the many gods that reside in this pilgrimage town. Pushkar city has over 500 temples with main Pushkar temple. It is dedicated to Lord Brahma and the only Brahma temple anywhere in the world. According to the Padma Purana, Lord Brahma was in search of a suitable place to perform a yagna when the lotus he was holding fell from his hand and landed on the earth. A lake sprang up at the place where the lotus touched the earth and Brahma considering it a good omen decided to perform his yagna at that spot. He named the land as Pushkar (in Hindi 'push' means flower; 'kar' is hand). 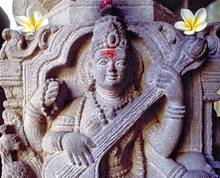 But as his wife and Goddess Saraswati failed to join him, he married a local maiden Gayatri and completed the ceremony. On getting to know about this, an enraged Saraswati cursed Brahma that he would be worshipped only in the land of Pushkar and nowhere else on earth. The temple is constructed on the banks of the Pushkar Lake in the 14th century. Pushkar temple spreads the splendid aura around it. Built on a raised platform, it has marble steps, a ‘hans’ (goose-the official carrier of Brahma) in the gateway with a red sapphire on its crown. It also has beautifully carved silver turtle that sits with its face towards the sanctum. The temple has a four-headed idol of Lord Brahma which is magnificent. Pushkar temple is located at 10 km from Ajmer. Ajmer is well connected with road and rail network. This is famously known as Parshuram Mahadev temple or cave. Here is an ancient cave where sage Parshuram meditated to seek the blessings of Lord Ram. There are 500 stairs to reach down to the ancient cave. Priest of this ancient temple would tell the lots of stories of the history and also the formations which are called ‘Kamdhenu’. Temple is located 9km from Kumbhalghar Fort on Sadri-Rajpura-Parshuram Cave Road. Well-known as Surya Narayan temple, this temple in Ranakpur is built in 13th century and rebuiltin 15th century after destruction. Sun temple is made up of white lime stone in Nagara style with a delicate ornamented work. Sun temple faces to the east direction and has a sanctum crowned with a 'chikhara'. The temple is located near the Ranakpur Jain temple. Lord Sun idol is shown as riding a chariot. Temple wall has great carvings of warriors, horses, and celestial bodies which represent the artistic excellence of the people of the bygone era. It has an octagonal mandap before the sanctum. There are six verandas in octagonal mandap. Sun Narayan temple gets devotees from all around the country who come for the blessings of Lord Sun. This is a famous Lord Shiva temple in Pali city. The shrine was constructed by the King Kumarpal Solanki of Gujarat in 1209 CE. Located in the main market of Pali, Somnath mandir has unique 'shilp' art. Known for its rich history, Somnath temple has intricate carvings on the 'shikar' and pinnacle of the temple. There is a Shiva Linga inside the temple along with the idols of Parvati, Ganesha and Nandi. Raj Kumar Pal Solanki brought the Shiva Linga from the Saurashtra region of Gujarat. 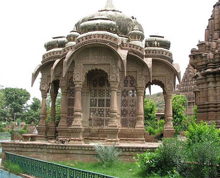 A majestic temple of Sun God is situated about 65 km north of Jodhpur city in a small village Osian. There is an array of about 100 ruined Jain and Hindu temples in the Osian village that back dates to the 8-12th century. Osian is located on the boundary of the Thar Desert, on the Jodhpur- Bikaner highway. It is also known as the ‘Khajuraho of Rajasthan’. The city of Osian is said to have founded by Utpaladeva, who was a Rajput Prince belonging to Pratihara dynasty. In those times, the city was named as Ukesha or Upkeshapur and was a major religious centre of the kingdom. Out of the many ruined temples here, only 18 shrines are still there unfolding the royal legacy of past. Amongst these temples, Surya temple, Harihara temple, Sachiya Mata temple and a Jain temple dedicated to Lord Mahavira get the prime importance. Osian is regarded as a prominent pilgrimage site for Oswal Jain community. Ravages of the time have destroyed these temples to an extent, still their charm attract people to visit the ancient city of Ossian. The Surya temple of Osian back dates to the 10th century. As the name suggests, this temple is dedicated to Sun God. The altar comprises the striking idol of Lord Surya. Visitors can also see the idols of Lord Ganesha and Goddess Durga in the main hall. The ceiling of the temple is adorned with the images of serpents coiled around lotus flowers. The life-story is depicted here in the form of murals and scriptures. The structure of this temple is often compared with the Sun Temple at Ranakpur. The Sachiya temple is dedicated to the Goddess Sachi, the wife of Lord Indra (Rain God). Sachi Mata is also known as Indrani. The initial structure of the Sachiya Mata temple was built in the 8th century while the present structure was constructed during the 12th century. This historic temple has two other shrines that are dedicated to Chandi Devi and Amba Mata respectively. There are three Hariharan temples in Osian. The first two temples were built in the 8th century while the third one was built in the 9th century. These temples that date back to the medieval period are dedicated to Lord Hariharan, a union of Lord Shiva and Lord Vishnu. All these temples are radiant with sculptures and are built on a raised platform. The Mahavira temple was built by Pratihara King Vatsa in 783 AD and dedicated to Lord Mahavira, the 24th Jain Tirthankara. The main shrine is placed on a high platform made of sandstone. The altar encompasses the idol of Lord Mahavira. In the hall, three balconies make the altar well ventilated. The temple with stunning architecture is considered as an important pilgrimage of the Jains. The main door of the temple is curved with an image of young maids on it. The main balcony is adorned with intricately carved pillars and in another balcony one can find stylish construction.